Today started out the same as yesterday: Glass of water, cold baked yams. Mid-morning, I had a snack of celery with kale butter. For lunch I made a salad with red potatoes, heirloom tomato, scallion, red onion, and fresh basil. The tomato was unbelievably sweet and juicy, but the red onions were overpowering. I'll use less or leave them out entirely next time. Then it was off to Alemany Farm for some hot-weather work. I wilted under the sun while weeding and harvesting purslane, and retreated to the shade of the willow tree to wash and pack produce. While at the farm I nibbled on some almonds I'd brought, along with freshly-picked loquats and cherry tomatoes. 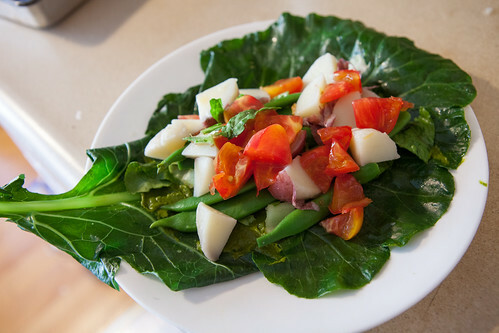 I mentioned to John, the guy in charge, that I was doing this challenge, and that I was interested in using collards for wraps. 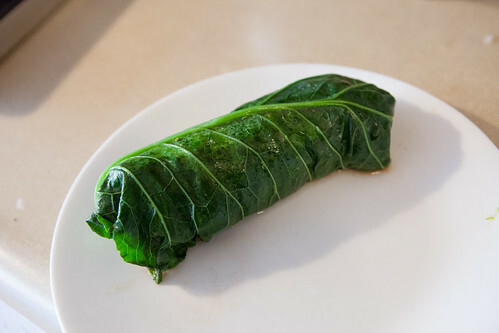 I'd always avoided collard wraps as I associated them with low-carb dieting, but now I had a motivation. He explained to me how to shave down the stem of the collard and steam it for just a few minutes so it would be pliable. He also gave me some scarlet runner beans, which he also said to steam for no more than three minutes. I'd planned to have the remaining red potatoes with kale for dinner, but I couldn't resist using freshly-picked collards and beans. So I steamed them as instructed, and added tomatoes, lettuce, and kale butter. For my second helping, I added a red potato to make it a bit more filling. These wraps weren't the tastiest things I've ever eaten; I should have added some fresh herbs, but I was tired and hungry. The important thing is that it showed how easy it is to use collards as wraps, which will come in handy even after this challenge as I've had trouble finding vegan tortillas that are also whole-wheat and oil-free (vegan is a requirement, the others are preferences). And as shown in the photo at the top of this post, a collard leaf wrap can be quite attractive. I'll probably have some frozen strawberries blended with almond milk before I turn in tonight. Gotta beat the heat!